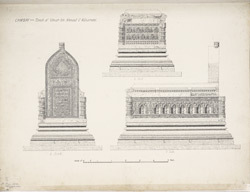 Illustration of the details of Omar bin Ahmad Al Kazaruni's Tomb in the Jami Masjid at Khambhat in Gujarat from James Burgess' 'Original Drawings [of] Muhammadan Architecture in Gujarat.' Khambhat or Cambay, is an ancient sea-port, about 84 km (52 miles) south of Ahmadabad. The city was captured by 'Ala u'd-din Khalji in 1304 and the mosque was built shortly after in 1325. On the south side of the mosque is a square domed tomb, built of marble, where 'Umar bin Ahmad Gazruni (d.1333) is buried. This image shows the delicately carved end panel of the grave. Burgess wrote, "the end slab is beautifully engraved: round the outer margin is the first twelve and a half verses of the famous Surah XXXVI...In the upper part of this slab, and on an inner border is Surah II, v. 256, - "the Throne-verse,"...and on the base of this triangle, on the left side, is the conclusion of verse 151 of Surah II...and on the right side , the end of Surah XXXVI, v. 52...In the enclosed area is written in beautiful characters, with stems elongated to fill the space, the larger Kalimah or creed...Below this, and separated from it by an ornamental band, is an area having on its right and left borders Surah III,vv. 16 and 17...and at the top of the central panel, vv. 163-165 of the same Surah, and under it the Epitaph...On the west side of the tomb the upper band contains Surah XXXVI, vv. 65-71; and the lower vv. 72-79 inclusive of the same."